SAN ANTONIO, Feb. 27, 2018 /PRNewswire/ -- Global law firm, Dentons, has announced CPS Energy President & CEO Paula Gold-Williams as a Dentons Smart Cities/Communities Think Tank Energy industry co-chair. The Dentons Smart Cities/Communities Think Tank will house legal, business, and policy thought leaders to advise public and private stakeholders on what Denton views as the "14 Pillars of Success" for a Smart Cities/Communities program. Gold-Williams will co-chair the Energy Pillar along with former Secretary of Energy, Dr. Ernest Moniz. The Energy Pillar will look at how Smart Cities/Communities will incorporate a multi-directional grid and advance clean technology solutions that will include a broad array of distributed energy resource measures. The work of the Think Tank will be highlighted at the Smart Cities Summit 2018 in Washington, D.C., July 25-26, 2018. 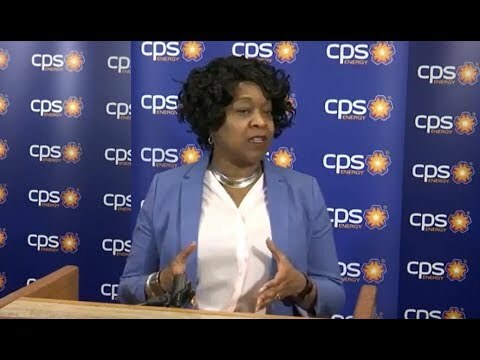 "My appointment to co-chair the Energy Pillar of Dentons Smart Cities/Communities Think Tank is an honor and timely as CPS Energy is an active participant in the City of San Antonio's Smart SA City efforts," said Paula Gold-Williams, President & CEO of CPS Energy. "I look forward to working with global energy leaders in formulating solutions for communities to implement as they prepare for the future. I'm thankful for Dentons' recognition of the work that CPS Energy is doing for the San Antonio community and I am eager to get to work with the Think Tank." "Dentons Think Tank will offer general legal, economic and policy options on how to best counter the challenges presented in identifying and deploying technologies and strategies needed to become a Smart City/Community," said Clint Vince, Partner and Chair, U.S. Energy Practice and Co-Chair, Global Energy Sector, Dentons US. "Gold-Williams' energy experience and leadership will propel the Think Tank effort to success and is a testament to CPS Energy and San Antonio's commitment to Smart City implementation." "The City of San Antonio (COSA), along with our other partners like CPS Energy, are working closely together to address the future opportunities and challenges our community faces as our area is on path to grow over 1.0 million more people by the year 2040," said San Antonio's City Manager, Sheryl Sculley. "Under Gold-Williams' leadership, CPS Energy continues to align their foundational work with the City's Smart vision that focuses on building a connected, inclusive, and resilient community that supports a high quality of life for San Antonio. Her status as an energy thought leader and innovator, as well as her think tank appointment will be beneficial to our community's overall efforts to apply best practices, learnings, and resources to the meaningful work ahead of us." According to the World Health Organization, urban residents account for 54 percent of the total global population, and that figure is projected to grow approximately 2 percent each year until 2020. In San Antonio, the City's population is expected to increase by approximately 1 million people by 2040. To meet the demand of this growth, San Antonio will have to meet the challenges of increased congestion and the need for clean, resilient and reliable supplies of energy. CPS Energy has invested in modernization of its electric grid that will be a platform for enabling new products and solutions for the growing San Antonio Metropolitan area. The Think Tank announcement was made following the 2nd Annual Future of Energy Symposium, hosted by CPS Energy, that took place at Texas A&M University – San Antonio on February, 27, 2018. The Future of Energy Symposium provided informational sessions by the utility's executives and energy leaders from around the country and included topics that addressed how the utility is leveraging data to meet customer needs and expectations; how energy provides a foundational role for the City's Smart City initiative; the current state and future of physical and cyber security; and the path CPS Energy sees for moving San Antonio forward. Established in 1860, CPS Energy is the nation's largest public power, natural gas and electric company, providing safe, reliable, and competitively-priced service to 804,000 electric and 343,000 natural gas customers in San Antonio and portions of seven adjoining counties. Our customers' combined energy bills rank among the lowest of the nation's 20 largest cities – while generating $7 billion in revenue for the City of San Antonio for more than seven decades. As a trusted and strong Community partner, we continuously focus on job creation, economic development and educational investment. True to our People First philosophy, we are powered by our skilled workforce, whose commitment to the community is demonstrated through our employees' volunteerism in giving back to our city and programs aimed at bringing value to our customers. CPS Energy is among the top public power wind energy buyers in the nation and number one in Texas for solar generation. For more information, visit cpsenergy.com.